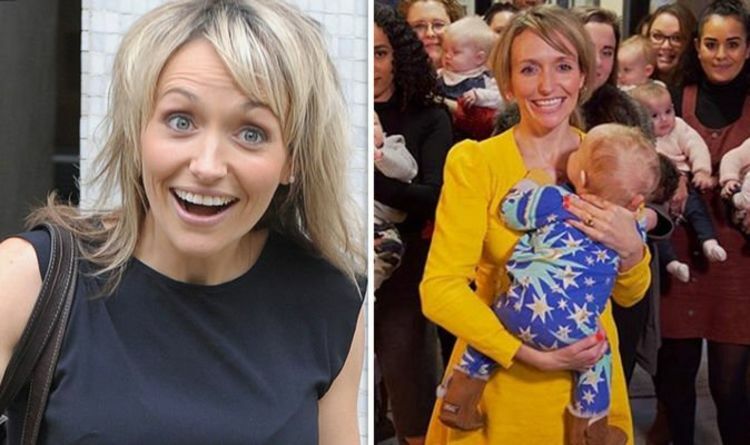 Kate Quilton, 35, who presents the Channel 4 show Food Unwrapped alongside Jimmy Doherty and Matt Tebbutt, has opened up about motherhood and admitted she and husband James Lance, 44, are completely “bowled over” by their son. In an exclusive interview with Express.co.uk, when asked about life as a first-time mum she spilled: “Oh my goodness. It’s total joy. I think everyday me and my husband are just bowled over by how we much love our little baby boy. “It’s an absolute joy. It’s extraordinary. I couldn’t recommend it enough.” The Channel 4 favourite married her actor husband James in 2016 before the pair welcomed their first child together in 2017. The same year, the television presenter surprised viewers with her pregnancy news on the Christmas Special of Food Unwrapped. Meanwhile, the journalist will be challenging the Formula Milk industry in her latest offering in the Dispatches programme tonight. The mum-of-one looks at the £40billion industry which she suggests uses “biased” information through advertising to profit off parents who are unaware that all formula milks are “nutritionally equivalent” even if the price varies. Speaking ahead of the show, Kate said: “I think one of the shocking things is if you compare those first milks they are nutritionally equivalent yet some of them can cost up to three or four times as much. The Dispatches programme’s findings show Sainsbury’s Little Ones formula costs £175.99 for six months of formula, while the same amount of money only buys three and half months of SMA Pro First Formula and two and a half months of Aptamil Profutura Stage 1. They also found pre-mixed bottles of Aptamil Profutura cost £789.31 for six months of use. As a result of the investigation, the British Medical Journal says they will no longer accept formula milk adverts. Speaking about what she hopes viewers will take from the show is that the investigation enables parents to make an informed decision based on fact and not on “biased” information. She said: “I just hope it helps to inform parents so they can make informed choices on how to feed their babies. “From what formula to choose, based on facts and not biased information. She continued: “The funny thing is if your breastfeeding your baby in the early hours of the morning, it is highly likely your going to see formula milk advertising at that time. The Great Formula Milk Scandal: Channel 4 Dispatches, airs tonight on Channel 4 at 8pm.